It's back to school time and one of the most dreadful parts of that is having my kids be around so many germs and other kids who may be sick. Hand-sanitizer doesn't always work in our favor. A must have in my children's backpack along with hand-sanitizer is Chloraseptic total. This sugar free, fast acting relief lozenges help suppress cough, minor irritation, pain and sore throat for up to 4 hours. Be Prepared. A sore, scratchy throat is often the first sign of a cold coming on. 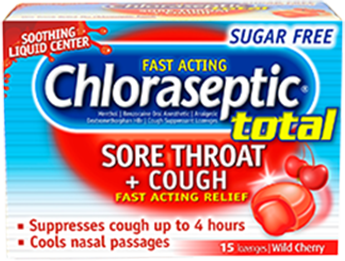 Be sure to have Chloraseptic® spray and lozenges on hand to help as soon as it starts, they provide almost instant relief! Stay on Schedule. During summer break, many families loosen their schedules – bedtimes are later, meals aren’t as planned. To stay healthy when you go back to school, get back on schedule! A good night’s sleep and a well-balanced diet is your best defense against germs that can make you sick. Get immunized! Getting your flu shot is the best way to prevent the flu! Remember that the flu and the common cold are different – the flu shot does not prevent colds. Want to know if the flu is going around in your area? Visit www.chloraseptic.com/flu-tracker to find out! Wash your hands often. And do your best not to touch your face! Germs are commonly spread from surfaces to your hands, and can make you sick when you touch your nose, eyes, or put your hands in your mouth. Break those habits! Relax. Rest. Repeat. If you are sick, stay home and get plenty of rest. If you encounter sick people at work or school, stay away and clean shared items before using them. Computer keyboards and telephones are common culprits for spreading germs! Stock Up. Stock your medicine cabinet so you are prepared in case you do get sick. No one likes to shop when they don’t feel well. Keep pain and fever relievers such as ibuprofen or acetaminophen on hand, as well as pseudoephedrine for stuffy noses, and Chloraseptic® spray and lozenges for sore throats.